If you’ve never heard of Day of The Tentacle, let me give you the summary of why you should want to play it. Day of the Tentacle is a drive-in-horror movie where the world is saved by embarassingly incompetent screwballs who solve problems with rube goldberg solutions to sometimes extremely simple problems. It is a ninny fiesta. Why I guess it’s Point-and-Click Season here on press.exe. 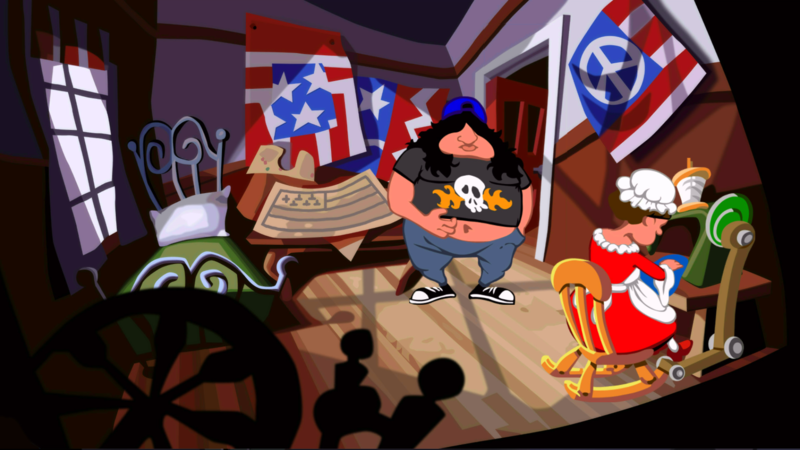 With Full Throttle tucked away, I thought I’d take the time to belt through Day of the Tentacle, released around the same time by the same people from the same assets. As a veteran and fan of the previous games, then, obviously this one had something to prove to me, right? Well, this remaster is in my opinion pretty much flawless. I’d normally downplay this with ‘I’m no expert’ but I kind of am when it comes to this game. Day of the Tentacle plays as well as it ever did, and the new interface doesn’t really diminish the game at all; it lets the visuals take up more of the screen, lets the sprites be bigger, more detailed, but the artists resisted the urge to make them more lined, more unnecessarily visually complicated. Also, you can just straight up set the game to play in the old art style if that’s what you’d rather. There is one area where pixel art isn’t quite perfectly translated, though. In the older style, pixel smiles were often a single line of white pixels, meaning that a smile could be a grin, or it could be mugging or it could be a fake smile and you could interpret as you would. In the remake, these are a bit less ambiguous. That can be good or bad, but it’s still one of the differences I really noticed. The upgrade also helps things be a bit smoother. It was hard to really properly grasp how much the clearer visual elements would be for new players, people inexperienced with the game to solve puzzles. Thanks to the introduction of a new piece of tech— holding down a shift button that highlights all the clickable objects — there’s a lot less of the game spent trying to find the things you can interact with, and a little bit more spent trying to work out how to use those things to solve puzzles. 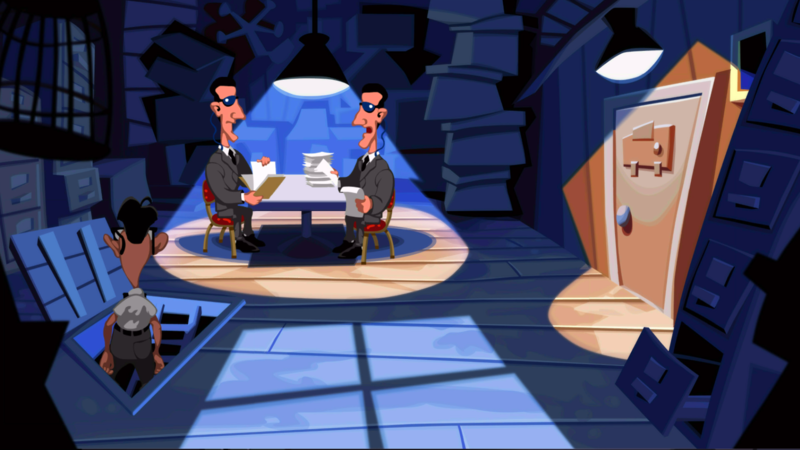 Broadly speaking, the puzzles in Day of the Tentacle avoid the problem of the pixel hunt. Broadly. Typically speaking objects are visually distinct, and the remaster made them more distinct. These are a sort of access thing, a dismantling of one of the genre’s unnecessary barriers. Point-and-clickers weren’t coin munchers, they didn’t (usually) have a life system to keep you penned in, and that meant the simplest barrier they had to keep you from simply solving puzzles was make finding objects was hard – hard in a very pragmatic sense, hard in that you, the player of the game didn’t have access to information the game was ostensibly waiting for you to find. So the signposting, the signalling of the objects is almost a philosophical concession: We are going to put away this tool that makes it harder to engage with the rest of the game. 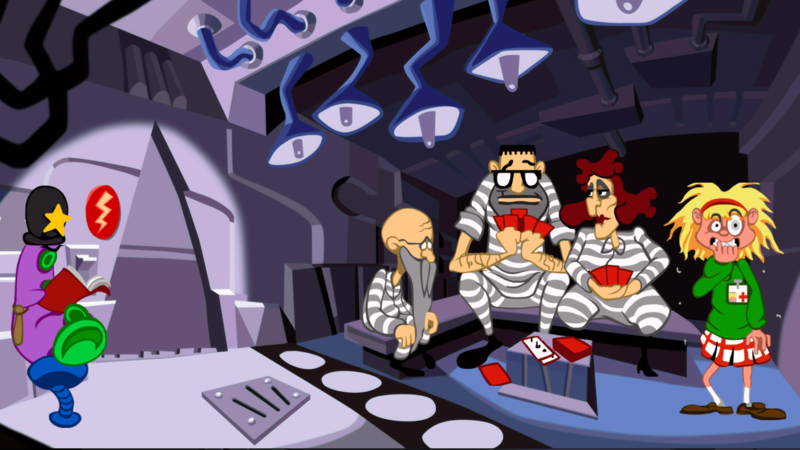 As for discussing the nature of the puzzles, the quality of the puzzles, a caveat: I know the solutions to Day of the Tentacle. I sat down and played through the whole thing in one sitting after years away from it without breaking stride and with literally only one or two dead-end moments trying to remember anything. I didn’t have to solve puzzles, I just had to implement solutions I already knew. Understand that as I talk about the puzzles. 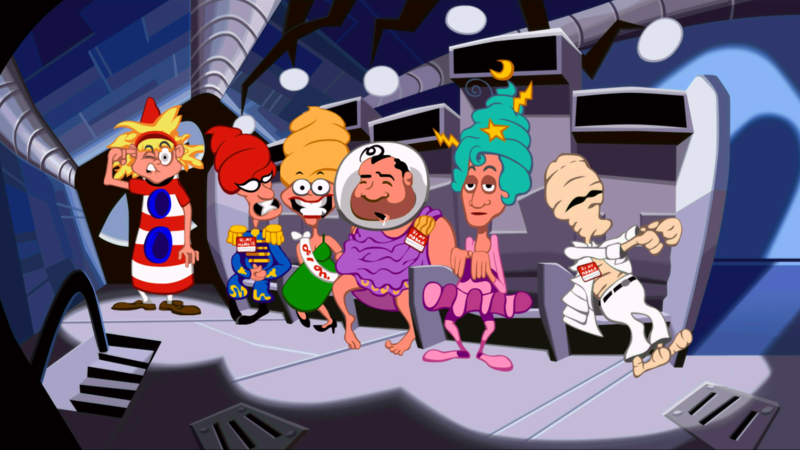 I think the thing that most defines Day of the Tentacle is that it wants to be funny. Not just that the game is full of jokes, but the game wants being funny to be part of how you approach it. What this means is that in addition to characters having dialogue delivered as jokes, and the physics or boundaries of the world being themselves, also jokes, but also there’s an element of the game where the solutions to puzzles are themselves things you’d do to set up jokes, or require you to think in terms of jokes. That is, the solution to the puzzle is to literally set up a very poor Dad-style joke. There’s really no reason to do it, either, and this is one way in which Day of the Tentacle shows a sort of failure of its era of conveyance. The problems you were presented with don’t really indicate ‘causing a storm’ is a solution, because that’s not really a thing that you’re ever suggested you can do. I mean, I stumbled onto this in my play through, but you have to stumble onto it twice over – because this requires you to get some soap, a bucket of water, and a brush, and each of those things require multiple steps. 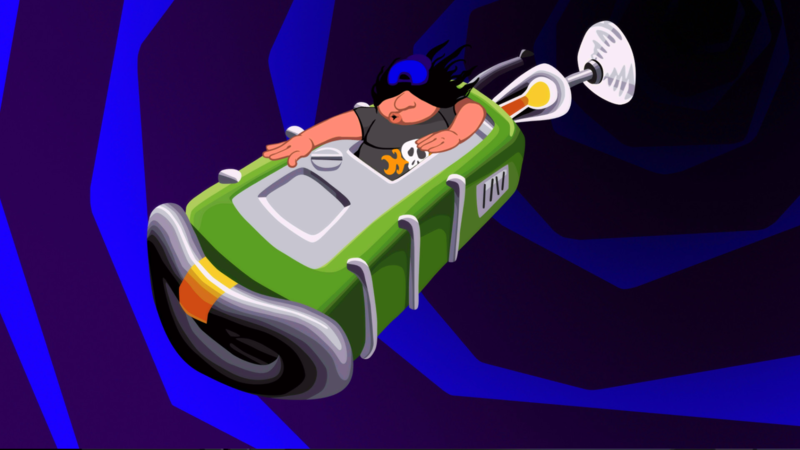 None of this is bad, but it means that the defining feeling of Day of the Tentacle is that classic 90s-era Point-and-Clicker hero wandering around rubbing things on things, but complicating it is the addition of time travel and two different characters. Getting items from one character to another can be a puzzle as well, because they’re too big too pass around. Characters use objects differently, too. Generally speaking, the biggest challenge of Day of the Tentacle is identifying which puzzle you ‘need’ to solve next. Which ones are gated behind other puzzles, which ones are just achievable, and which ones will solve problems you can see that you’d like to solve. It’s not a game where you can come up with a plan and enact it, much more a game about durdling around. On the bright side, there are a lot of problems you can solve by asking yourself: What’d be funny? And it is funny, which is the best thing about it! While the problem-solving genre would be extremely messed up if the game was unfunny — and feel free to recognise that if you don’t find it funny in the basic youtube overview, you probably won’t like the game at all — but the fact that I find this game so very, very funny means that none of the stuff about fumbling around and rubbing objects against one another gets too tired. There’s precious little wasted space that can be used for jokes. Almost everything that can be funny is made funny, with all the dialogue – even the stuff that’s used for puzzle hints or signposting problems – is really funny. There’s even little bits and pieces that make durdling around funny – there are pauses and hesitations that the game throws at you, cutaways of both the future and the past, showing you that even when you’re not around, the world you’re moving around in and it’s still populated by the same funny ninnies. Because that’s the real thrust of the story: The game is set in a world where everyone is a ninny and the best hope for the world is three lesser ninnies. 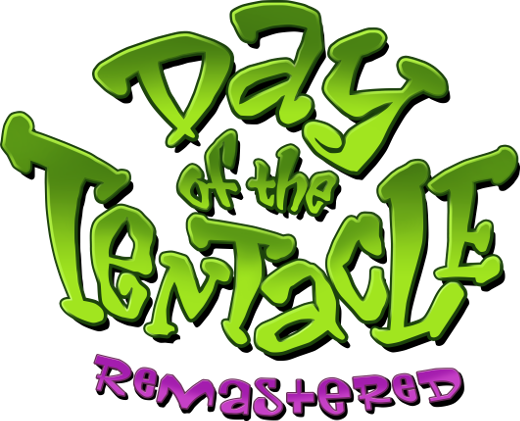 You can get Day Of The Tentacle Remastered at Humble, Good Old Games, and Steam.